Looking to buy an iPad Air 2 for Christmas? Staples has a sale right now on various models. Right now, you can save $100 off the 64GB iPad Air 2 Wi-Fi at $559, available in Space Grey, Gold and Silver. 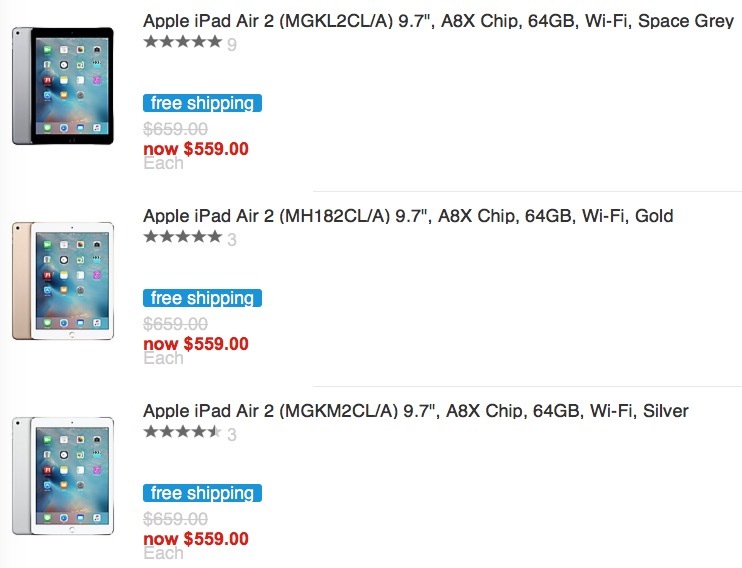 The same discount is being applied to 128GB Wi-Fi iPad Air 2 models, available for $669. For 16GB iPad Air 2 Wi-Fi models, they are on sale for $70 off at $479. You could also try price matching Best Buy to save a few more bucks as well. If you’re on the hunt for a sixth generation iPod touch, the 32GB model in Space Grey is $30 off at $269. Both of these sales go until December 24, leaving you lots of time to nab a present in time for the 25th.